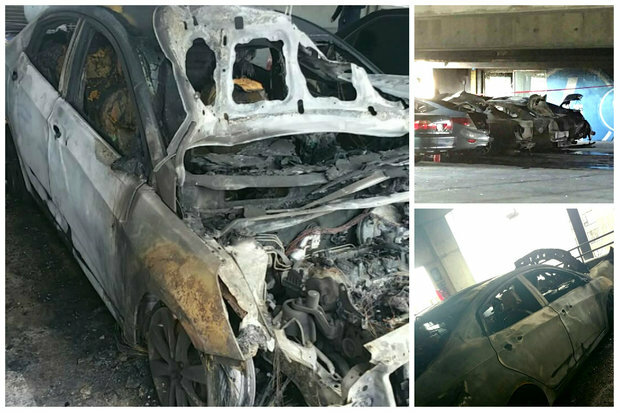 Daisy Morales' car was destroyed in a Nov. 13 fire at a Rogers Park private parking garage. ROGERS PARK — Iraq War veteran Daisy Morales realized her car had been among four others charred and melted in an early morning fire at a Sheridan Road parking garage when she went to meet a friend on Nov. 13. By then, between 10-11 a.m., the fire had already been out for hours, but broken glass and evidence of smoke and fire damage at the Col. Jennifer Pritzker-owned private parking garage were still everywhere. Morales, 25, last saw her car on the garage's fourth floor around 12:30-1 a.m. after her usual 4 p.m-midnight shift as a security guard at the Uniter Center. Not realizing what had happened once she returned in the morning, and thinking some of the police tape was from construction, Morales said she crossed the caution tape and walked up the stairs to find the scene where an explosion had taken place, engulfing five cars in flames. She went back downstairs and walked up to the other end of the fourth floor where it then became evident "the car was just gone," Morales said. But the brand new bumper she had recently installed had completely melted off and was on the concrete floor. She said she was told security cameras in the garage had captured someone specifically targeting one car. Chicago Police have said the investigation is currently being handled by the department's arson unit and a man who identified himself as a building contractor also said he believed the incident was a suspected "arson" at the scene on Nov. 13. Morales said she exchanged information with a detective who gave her a case number for the police report, saying he would follow up in the coming days. She said a week later, she's yet to receive an update on the incident. Morales said she has spoken to someone who identified herself as the "owner" of the building, who expressed condolences and said while she supported her, Morales needed to file a claim with her insurance and did not offer specific help. She said the woman who identified herself as the owner was not Pritzker. Before the garage was built, its developers, Pritzker-owned Tawani Enterprises, promised security measures at the parking structure like surveillance cameras and guard patrols from 6 a.m.-7 p.m. The security features of the garage was part of the reason Morales supported its development, despite some opposition from neighbors. Morales said she has seen a security guard in the garage at night when she gets home, but has only witnessed the guard sitting in his vehicle parked near the garage's entrance and not actively patrolling. She acknowledged, however, she is only at the garage briefly while she parks and leaves. When Morales stopped by to check on the contents of her car Monday, she said it looked as if someone had rummaged through her trunk. She said she was told by the security guard there is no one patrolling during the day — a fact that she found concerning. A Tawani spokeswoman declined to comment if any security guards were on duty during the time of the fire, believed to have started just before 5 a.m., or if any they planned to add any security measures after the fire. In the meantime, Morales said she is able to get around by public transportation, but it's time-consuming and costly. She said she's concerned for her personal safety walking to and from CTA stations near the United Center and in Rogers Park. She said due to an error when switching car insurers after leaving her active duty post in New York she did not have comprehensive insurance on the car, meaning her insurance won't cover the damages. Morales has served in the Army since she was 18 years old as a military police officer and was deployed to Iraq in 2009. For the last few years, she worked at a post in New York before moving back to her hometown of Chicago. Morales said she will likely have to continue to pay back the $16,000 principle on her car loan each month for "a car that doesn't even exist." Since she's already on a tight budget, she won't be able to afford a new vehicle. Morales' 17-year-old sister, who lives with Morales in Rogers Park, started a GoFundMe campaign to help raise $2,500 for a used car she can use in the meantime. "While the car may seem like just a material thing, which it is, we had so many memories in this car," the GoFundMe says. "My sister bought herself this car brand new as a sign for when she left 543rd to show that she was getting rid of all the old [and] negative in her life and starting new. She brought home her puppy who is now a big 2 year old German Shepard. She drove from Ft. Drum NY to Chicago and back Twice. She and I had many wonderful memories traveling in the car as well." Morales said she appreciates her sister's efforts, but is still trying to work out a solution through her insurance carrier and hopes that the garage's management company will step in to help — but she's not holding her breath. "I laugh about it because I don't know how else to react to it," Morales said. "I'm pretty much just expecting the worst."